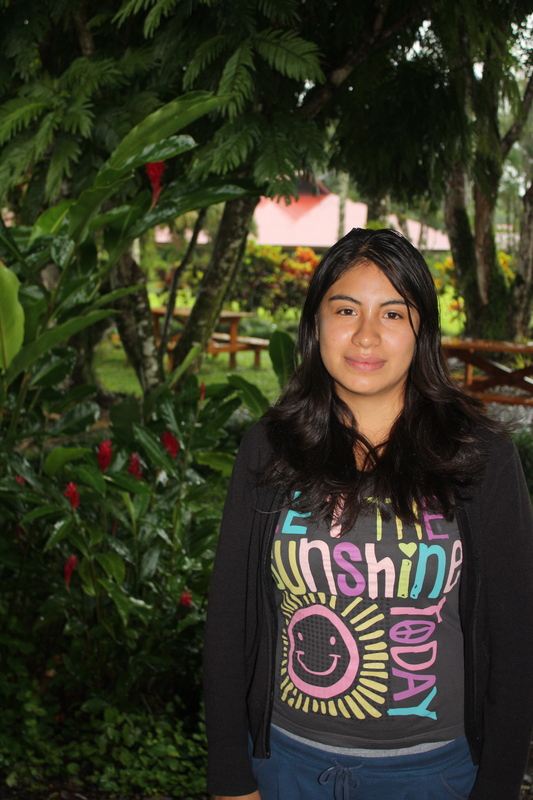 Wendy Almeyda attends EARTH University to study environmental engineering. Family: Mother, father, two sisters and dog, Bambi. Almeyda was admitted to EARTH University, home to students from 23 countries, after completing a rigorous application process. Many students who attend the university come from impoverished backgrounds and receive either partial or full scholarships. Almeyda will graduate from EARTH in December 2016. She chose the school after preparing for two years to attend a different university in Peru. EcoChronicle: Can you tell me a little bit about your life before coming here to study at EARTH University? Wendy Almeyda: I have been living on my own since I was 17 years old… I remember clearly that it was a Saturday when I found out that I got a full scholarship to EARTH. I had the option to stay, or come to EARTH University. I received the most support from my father, but it was a difficult decision for me. The costs were high, because things like visas, documents, notaries and sending things here began to add up. Before coming here, I had only been apart from my family for one month. Coming here meant that I would not see them for one whole year. My mother said, “If you want to stay at home, you can stay. We will support you.” But I decided to come. The first week that I was here, it was beautiful. I met all different types of people and made many friends, but after the first week I grew sad. The first year is the hardest here, because everyone is getting used to being apart from family. But getting to know your roommate helps a lot. …It’s like your mother and your sister. EcoChronicle: What was it about EARTH University that made you decide you wanted to be part of it? Almeyda: The first thing is that I am studying environmental engineering, but my life of travel and helping my father with agriculture was a big part of it. The decision was to continue a way of life I already knew but in another place. But coming here was a risk. I knew I had to learn something new, because the university in Lima was limited. I would have only been able to work and remain in Lima. Coming here, I was able to expand my options. Here, there are things that Lima doesn’t have – plants, animals and sustainability – three things the university in Lima doesn’t offer. EcoChronicle: Can you describe the daily routine of a student attending EARTH University? Almeyda: Normally, in my case, I go to bed at 9 or 10 and wake up around 3 in the morning. Then, I come here (to the cafeteria) to read or study. After that, the classes usually begin at 6:30 in the morning and go until 6 at night. Monday, we have cultivation and go to work in the fields. Tuesdays are math, oral communication, English and business. After class, we sometimes have group work and we have to take a little time for meetings. EcoChronicle: How do the methods of teaching here apply to real-world problems that people are facing? Almeyda: First, a lot of our work is in the field. There are days that we travel all day to communities to help people, and get to know farms. There, we talk to the owners to understand their lives in order to gain experience and knowledge in our areas. So the professor speaks to us about the importance of applying our learning inside the classroom to outside issues. EcoChronicle: What is your favorite part about being a student here at EARTH University? Almeyda: We learn the cultures of all the other students. You learn about all different ways of thinking, religions and cultures. That’s what is the best part. EcoChronicle: What are the most difficult challenges that you face here? Almeyda: The schedule of classes, and missing your family. EcoChronicle: Do you have a favorite project that you have worked with, or one that has made an impact on your life? Almeyda: Right now, we are doing a project to fatten bulls; it’s my group work. We buy small bulls at 200 kilos, and in nine months we have to raise their weight to 400 kilos. But there are fifteen bulls, and it’s a lot work. We are borrowing $1,500 at the beginning for their medication. We work in the dairy farm in order to use the land for the bulls, and at the end of the year we pay for all the bulls when we sell them. EcoChronicle: What are your goals after graduating from EARTH University? Almeyda: I want to work in communities in Peru, where there are regions with very poor people. I want to help with the cattle and agriculture in those areas. EcoChronicle: How do you think your views on life have changed after becoming a student here? Almeyda: I always thought that the people in Africa were all poor. I used to think they were inferior people. But a lot of the students here from Africa have studied a lot, and are able to speak three different languages. My beliefs on the people from Africa have changed tremendously, because they are the students who work the hardest here. EcoChronicle: What was your first childhood memory that influenced you to go this route? Almeyda: Around 10 or 12 years old, I would ride on the back of my father’s motorcycle for three hours to go work in the fields. My back would hurt and we would see the women in the fields, and they would give us things to eat, like sacks of potatoes and corn, as a ‘thank you’ for helping them. They were very poor and didn’t have much money to pay us.